After years of blogging as Agent Fang, I’ve decided to create my own domain. If you want to see my progress in the stock market, you can find me here. Wish you all the best for 2014. May all your financial situation be a success! My last trade of 2013 is re-buying Mastercard funded solely on margin in my cash account. Mastercard will be splitting their shares 10 for 1 on January 9, 2014 and raising their dividends by 83% from 60 cent to $1.10. Currently, I have 30 shares of MA in total after my new purchase. For every share I have, I will get additional 9 shares which will total 270 300 shares. If the dividend is paid out after the stock split that will mean I will get $297.00 per quarter in dividends. Am I correct?? I will wait and see! Looks like dividend will go from $1.10 to 11 cents after the stock split as pointed out by Maureen. Wishful thinking on my part for receiving so much per quarter. I am excited to see how my Mastercard will play out in 2014. Mid December, I bought a Dewalt 12V Lithion Ion Drill kit from Canadian Tire that was on sale from $179.99 to $99.99. That’s a great deal! So I bought the Dewalt Drill as a Christmas gift for my BF. Come Boxing Day… the day after Christmas, everything is on sale! 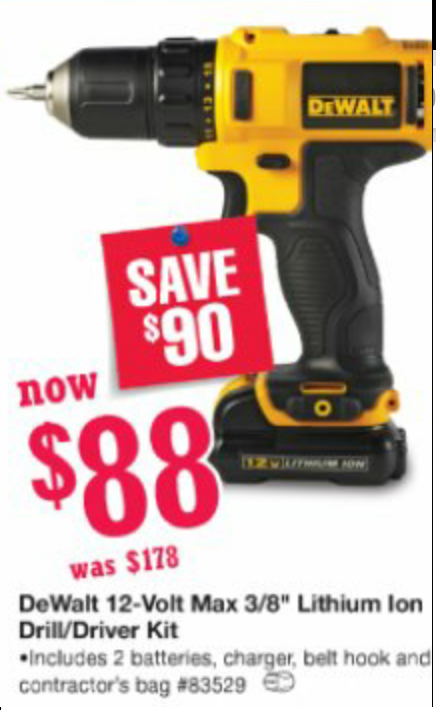 My BF looked through the flyers and found the exact same Dewalt Drill is on sale for $88.00 at Lowe’s for Boxing week! He asked me if I paid more for the drill or not? I meekly answered yes. He told me to get a price adjustment and Canadian Tire will beat the competitor’s price by 10% with Canadian Tire money. I kind of groaned at the idea of getting a price adjustment. But today I had the day off, so I refunded my original purchase at customer service. Next, I headed to the cashier to “re-buy” my Dewalt Drill. I showed the flyer to the cashier and asked her to price match the item. She confirmed it by adjusting the price for me. In total, I saved $13.43 and in addition, I received $8.80 in Canadian Tire money. Most people… might think it’s a hassle, sometimes embarrassing to go back to the store to ask for a price adjustment or save a few bucks. It’s not worth their time… I kind of agree, but if you’re saving more than a few bucks… then maybe it’s worthwhile. Always keep your receipts and keep your eyes open to sales. You never know how much you can save further down the road. Usually on my days off from work, I like to snooze in bed till later in the morning. But I didn’t sleep in today as I am hosting my first family dinner! Best to have everything all prepped ahead of time, so there won’t be any last minute rush! I cleaned most of the morning away and tidying up. Now, I have ample time to sit back and relax before starting the side dishes. What’s on the menu? Pot roast in the slow cooker for 10 hours, it’s cooking right now… Almost half way through. Pre-marinated our wings the night before, so all I have to do is pop them in the oven. For our sides, we have corn, mushrooms, tomato & avacado salad, yams with stuffing and gravy! Voila, it’s a full on feast! This past year has been good to me. I recently got engaged, I went on a Mediterranean cruise and Costa Rica, I received a windfall, and I got a nice bonus from work… Everything seems to be falling into place! My stocks are at their all time highs! And I don’t even have to liquidate any of my stocks for the down payment for my upcoming condo! But I need to find a way to pay my 0% balance transfer from MBNA back $11,500 by September 2014. For 2014, I’ll be taking on a mortgage. Monthly payments will be 30% of my take home income. My amortization is 35 years and I am paying the absolute minimum. But I plan of making lump sum payments to pay this bad boy off. I hate throwing money away to fees and interest. I hope to find a good tenant that will help out with the mortgage. On top of the mortgage, there will be monthly occurring expenses like strata fee, insurance and property tax. All that needs to be accounted for. I would love to max out my TFSA for 2o14, but looks like I’ll just have to play with the money that I have in my TFSA already. No more new money will be funneling to my stock portfolio. But I might add some money to my RRSP as I don’t want to pay taxes to the government, dreaded CRA! My goal for 2014, I want to be more accountable for my trades. I need to set up a system to track my profits and losses. I want to trade more on my Virtual Brokers margin account. Right now, I am using $10k in margin. I need to be more bold in my trades meaning putting more capital into ONE stock, of course, I’ll be watching it like a hawk! One wrong move can be quite costly. That’s the only way for me to leverage myself to more gains! To be continued. The only reason I am so aggressive with my money is that I do not make a whole lot of money at work. By saving and investing, making smart decisions, I can increase my net worth at a more rapid pace than just sitting idly by watching the rat race. I do not hold any bonds, EFTs, Index or Mutual Funds. I am purely a stock girl! Stocks all the the way for me and a little investment property. May 2013, I switched over my margin account from Questrade to Virtual Brokers for cheaper commissions, lower margin rates and depth II quotes. I am very happy with this move! If I was stuck at Questrade, I wouldn’t have traded or gained this much! Too bad, Virtual Brokers charges a fee for USD stocks held in TFSA and RRSP accounts… or else, I would have moved everything over from Questrade. Note: If I traded 32 times in Questrade at their minimum cost of $4.95, the total commission charges would have been $158.40! But I musta been drunk, when I bought LIQ.TO (Liquor Stores N.A Ltd) a few months ago! Currently, my biggest loser in my portfolio sitting at 20% loss (-$350). Good thing, I only bought 100 shares, right? It pays out $9 monthly in dividends, so far, I’ve collect $45. I will continue to hold unless it goes down even further then I’ll consider cutting my losses. Unless this is the bottom, and a good opportunity to jump in at low prices? Tough call….